The guitar is an excellent instrument to learn that’s versatile in multiple music genres. Atlanta Piano Fortissimo provides in home guitar lessons by highly qualified instructors in the convenience of your own home. The best age for children to start guitar lessons is the age of seven, but it varies with each child. When learning to play a guitar, a student needs to overcome some physical hurdles such as hand strength and nimble fingers to switch between chords on the strings. Some children develop those skills at the age of seven, and some develop them at a later age. However, students that are smaller in size with smaller hands have the option of buying half size guitars. 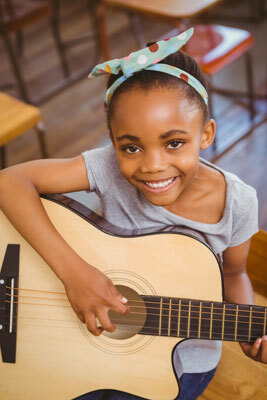 When learning guitar, students will be provided with homework, assignments to practice, and songs to memorize. This will require an incredible amount of concentration and patience to be able to encourage progress. Building up skills on the guitar requires hard work and routine practice. Students will learn to read standard notation, tab notation, and chord charts as well as learn how to become an independent musician. During lessons, students will learn via method books. They will need the following supplies for their guitar lessons; a guitar, a guitar case, a tuner, a neck strap (if not included with the guitar), and guitar picks. Guitar picks come in many different colors and sizes for you to choose from. A tuner will help the guitar strings to be in tune by listening to the vibrations of the strings, which tells you which way the peg on the guitar should be turned. There are many brands and types of guitars. They range in price, so it depends on your individual budget. Classical guitars are options for younger beginner students. The strings have a lighter tension, so it is not as harsh on the student’s fingers while they are learning the initial chords and fingerings for notes. Acoustic guitars are a little larger than classical guitars, and the strings are tougher than the acoustic guitar. Acoustic guitars are options for older students who are beginners and for adults. The guitar is an excellent instrument to learn, as it is versatile in multiple music genres. Music is a universal language. Guitar lessons and learning guitar improves academic skills because of the link of music and math. Students learn how to count rhythms, understand patterns and a beat, divide and more. It also develops motor skills and requires specific movements of the hands on the guitar in more than one place. Learning an instrument also refines discipline and patience, because students have to dedicate time and concentration to make sure they are practicing the correct hand positions, correct notes and more. There are many more benefits to learning music, but the most important is that it develops a lasting relationship with music that will last so much longer than the weekly lesson.